Derided in the past as a tool of criminals, handguns are the only reasonable choice in defensive firearms in the vast majority of settings and occasions. The criticism (by people who dislike all guns) is that handguns are small and hence easily concealable. Their twisted logic follows that the opportunity to commit a crime creates criminals. Hence, their opinion that owning a handgun can transform an ‘ordinary’ person into a homicidal maniac at the slightest provocation. Psychiatrists call this projection. Projection is when a person blames you, in advance, for a crime that they feel that they are capable of committing. What is ironic is that a large number of anti-gun celebrities and politicians have firearms registered to their name and/or have armed security details protecting them. The issue with gun control is not guns—it is control. Lots of power-mad people want you and I to be disarmed both politically and physically. The regulation of firearms is just a piece of that control puzzle. Tertiary in concern is your comfort level in carrying the gun, which is largely driven by the width of your belt and the weight of the gun. Having to tighten your belt to keep your handgun from flopping around will increase your blood pressure. The only solution I have found to this is to increase my cardiovascular strength and reduce the fat on the side of my abdomen. This is easier said than done but it is a goal and a suggestion to increase comfort while carrying a handgun on your belt. 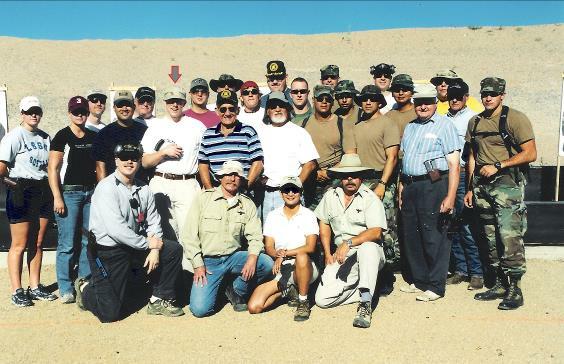 To the left is a picture of my training group from Gunsite Academy, August 4-August 8 2003. The class was Defensive Pistol 250 and was one of the most challenging and best weeks of my life. I had shot handguns frequently before I went to the class but nothing like I could once I had finished the class. There is NO replacement for professional training. I would advise you heartily and sincerely to get professional training with firearms if you are considering owning them for self-defense. This course taught me about safe gun handling, trigger control, selection and use of belt and holsters, malfunction clearances, safely and quickly drawing a handgun from a holster, the physiology of marksmanship, threat identification, REACTIVE SHOOTING, reloading, tactical movement through broken terrain and room clearing inside of buildings. Night fire was also covered. If you own a pistol for self-defense, I urge you to attend a training course at Gunsite Academy. This is an unpaid endorsement and I am proud to endorse Gunsite. There is a famous book that contends that people perish for lack of knowledge. It is common, among males especially, to think that they were born knowing how to shoot a gun. Macho silliness has also been known to cause dangerous levels of over-confidence. The usage of guns is not natural to human beings and is largely governed by fine muscle movements. Fine muscle movements tend to become crude and jerky under stress. To paraphrase a saying that I heard at Gunsite: “Be slow enough, fast enough” to hit your target. So which handgun should you own for your first handgun? The best handgun is that one that is comfortable and points naturally in your hand. A gun that does not fit will be difficult to learn to shoot with. Handguns require proper bone alignment in order to hit the target, just like shooting an arrow or throwing a ball. The recoil event happens too quickly to allow a handgun to be muscled into place. The shot will be inaccurate because human muscles cannot ‘twitch’ fast enough to compensate for the sudden rearward motion of a gun in recoil. You can quickly determine the proper fit of a handgun by picking an object on the wall (pointing in a safe direction) taking a shooting stance as if you were going to shoot the object, close your eyes and bring the pistol sights up to where you last saw the object. If the sights align well with the object when you open your eyes, you have found a potential new handgun. Please ask the person who handed you the firearm if this is ok before you do this, however. The other method tests bone alignment with your new gun and is similar to the first method but you need a mirror for this. With the weapon pointed at a safe location other than the mirror (located in front of a sufficient backstop), take a shooting stance as if you were going to shoot the reflection of your gun in the mirror. Close your eyes and point into the mirror. Open your eyes. If your gun sights line up with the gun sights reflected in the mirror, you have a handgun which points naturally in your hand and is a winner. A comical example of how human beings cannot be categorized, except in the broadest sense, happened to me when I was 21. At the time, I weighed 165lbf and had a height of 5’ 10”. The doctor said that I was obese. I did not see many obese joggers around me when I would fast jog 9-11 miles most every day… something had to be amiss. My torso is short, shoulders wide and my legs are long. People have dramatically different torso sizes and shapes—if you want to be as comfortable and prepared for self-defense as possible, you should try many guns and many holsters to find what can actually conceal for your body shape. Pistols are carried on your belt. Carrying a handgun on your belt allows for a fast and confident draw—IF YOU PRACTICE CORRECTLY AND SUFFICIENTLY. But I digress. Belt carriage also lends itself to concealment of the firearm due to the curvature of the human back. If your shirt is loose enough it will drape over a moderately-sized handgun and provide concealment. If it is not, you will get the police called on you eventually and they will want to see your concealed carry permit. You can carry the largest handgun possible on a belt holster because belts distribute the weight as comfortably as possible over your waist. Some social situations will require you to carry a smaller gun or to carry your gun in a less readily-accessible spot on your body. It can be argued that the increased concealment value of such a gun and situation offers a tactical advantage and I agree. 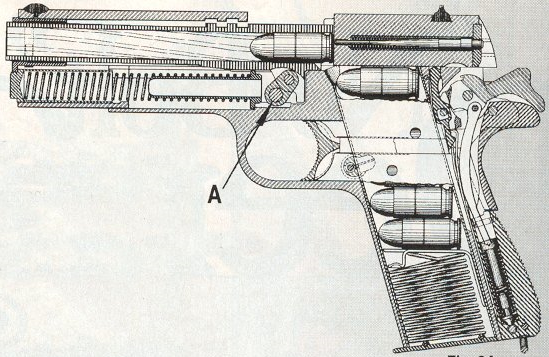 Mouseguns have a definite and positive role in concealed carry. Carry in a front pocket is the most common method though there are belt holsters available for the smaller guns. Unless you have beastly amounts of coordination, it may be difficult to find the small grip of such guns on your belt during an emergency. More exotic holsters exist and as you might imagine, I am a big fan of technological innovation. But I’m also a big fan of not poking my eye out during an emergency. Simple is the key. Ask yourself: “Does this make sense?” Some holsters offer innovative solutions to problems which exist and some holsters offer solutions to problems which do not exist. If the occasion arises that you have to pull a handgun and employ lethal force against other human being(S), you will be undergoing severe physiological stress during the event. Your motor skills will become clumsy, breathing will become shallow and your vision will narrow. It is not unheard of for the digestive system to spontaneously release its contents. Real combat bears little resemblance to the movies. Make sure to train realistically if you ever contemplate shooting a gun in self-defense.